I was so excited when I saw the trailer coming down our long driveway, and as Michael opened the door, Willow couldn't yet see me... but I could see her stretching her head up when she heard my voice. I think she could tell how excited I was to see her again. Willow reacquainted herself with her stall, but not before noticing her handsome new pasture mate who was intently looking at her from the main pasture behind the barn. We had closed the gate to the round pen which is attached to the barn... so there was a good 60 feet between them. We decided to take baby steps with their introduction. I know being on stall rest for the first 8 weeks of her recovery will be very hard for Willow, and it breaks my heart. She is not used to being locked in her stall. She comes and goes as she pleases, and she likes it that way. She was frustrated that the bottom half of her outside door was shut... she pawed at the door, and that broke my heart. I wish I knew for sure that she understood why this must be. I love this photo! Willow has a new bodyguard and buddy, and he will protect her from now on! Hurray! I think the second times the charm- what a great photo! I am so happy Willow is home- happy for everyone. I am so excited for you and for Willow. I just read your whole Velvet Willow Blog. Somehow I missed it even existing. I own your beautiful actions and am a horse lover but somehow I just didn't see you had a new blog. 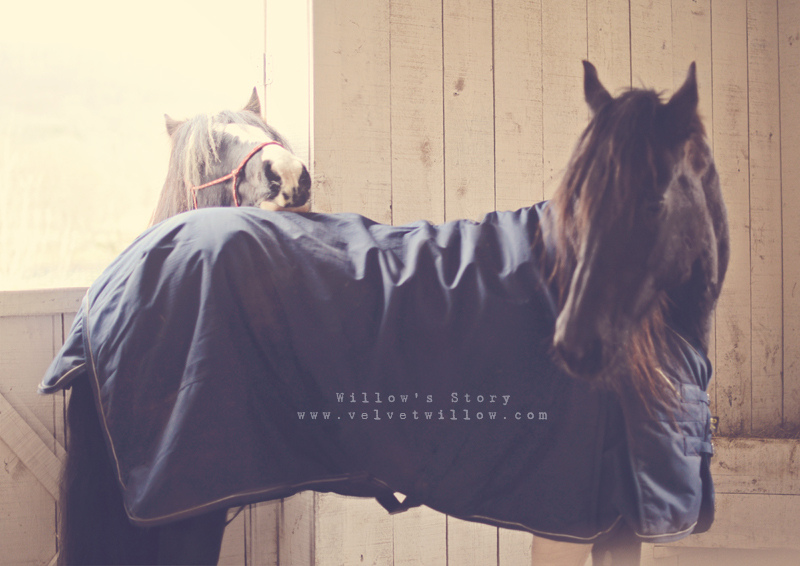 What happened to Willow is why I have a hard time even thinking of ever selling a horse. Here they are safe and loved and if you sell them you really never know what might happen to them. A horse trained and with the bloodlines she had she should have never had such a fate, and yet she did. I was an avid 3 day eventer, I gave lesson's, trained horses, and loved it. I had to have my Hannovarian put down and it broke my heart. I can't wait to start all over and work my way up back to upper level dressage but we don't have the money for that right now. For now it's about the kids (Maya adopted from Guatemala and Benjamin from Nevada). Maya is riding her pony now and it's great. My parent's live next to use and my mom and I have both rescued starved and neglected horses. Both of our horses and healthy and fine now, but mine had been on the slaughter truck headed to the slaughter house, and I don't know if my mom's would have made it thru the winter because he was so emancipated. It is horrible, I will never understand people. Enjoy your girl she sounds absolutley wonderful. Even though we can't ride with the snow here I can still go and smell our horses, there is nothing better then that. This is just so happy!! Look at him trying to get to know her! Makes me wish I was there to watch too!! We are back to our happy story in progress!! ...I still can't believe what happened!!! Such good news!! God bless you all. So Happy she's home and has Handsome new Friend ! I love following your story it's so a heart warming ! You are so very Talented and I know you must have the Biggest Heart in your Sate ! Thank you so much for being a Friend to Animals ! Wow what a moment you captured!! So beautiful! i love seeing the two of them together, puts a big smile on my face. so glad she's finally home. OH..they are perfect for each other..a match made in heaven : ) So happy for all of you!! Shana, I've been following Willow's story from the beginning. I'm so happy that she is home and that she appears to have accepted the new horse. I love your photo Shana - and I'm so happy that you have Willow home again! It looks like the new horse is a sweetheart and I hope he will become Willow's best friend! Maybe you could call him "Shadow". I am so happy that Willow is finally home!! What a great picture of the two of them..so sweet! It makes my heart happy! This put a grin on my face! I keep coming back to this photo. I love how your new horse isn't wasting any time checking out Willow. The way his head is in this photo is so darn adorable! Sorry to hear Willow had a choking episode again. I can't imagine how hard it is to watch and wait for it to be over and so helpless you must feel. Hopefully now that she is back home and things get back to normal for her, she will be more relaxed which will help somewhat with the choking. Prayers for healing from this choking issue for Willow..
What a great homecoming. Everyone needs someone who loves like you do in their lives. You never give up when others myself included would have. I want to give one word of caution from experience. It looks like you were in the stall when you took the picture. Be careful with her when other horses are present. They will react differently than usual when a new horse is present. My granddaughter and I both were kicked by my kindest sweetest mare because we had food in the pasture and there was another horse in the pasture with us. God's grace kept us from being seriously hurt. She whirled and kicked with both feet. One hoof grazed the back on of her little neck when she ducked and then caught me on the head and I fell in a lake. Could have been disastrous. The horse was just acting like a horse. I should have known better. I'm glad she made it safely home......now on to the recouperation! I am glad you are careful. We sometimes think they are like our dogs and we trust too much. My experience makes me want to make others don't make the same mistake. I love my horse, Gracie but will always be cautious. There is a Bible verse..God spared me sorrow upon sorrow...that is what He spared me of. awwwwwwwwwwwww how cute! She has a new friend!!!! I hope they will get along splendidly soon. Hope it with all my heart. Seriously, this needs to be scripted and a book written... She truly is the horse with 9-lives, let alone how other animals who connect with her r e a l l y connect. It is fabulous!! ...and such a wonderful story of the power of love, hope and dedication!! ...and so many people need to hear and experience stories like yours/hers. Thanks for sharing!! Shana, I have had an extremely stressful few days work-wise, and your stories about Willow and her new friend were making me laugh out loud this morning, which I really, really needed. Give them both a hug from this stranger from Arkansas...and let them know that they helped brighten my day today. How sweet is this?? Made my day! Such a sweet moment and you captured it perfectly!